Dessie outside Maisonette 9 in The Ballad of Gay Tony. Dessie is the bodyguard and doorman of the Maisonette 9 and features in The Ballad of Gay Tony. He is also a friend of Luis Lopez, often exchanging dialogue with him during Club Management missions and cutscenes. His voicemail of his phone says: "Yo this is Dessie, don't call me with any guest list requests, that ain't my department, anything else, leave a message". This hints that he is called many times by people who are trying to get in Maisonette 9 which annoys him as shown when Armando is trying to get in saying that "Luis is his boy". Dessie is voiced by Wilhelm Lewis. 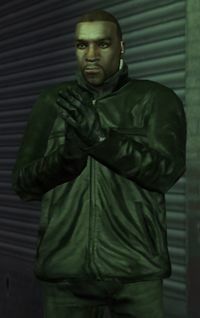 Just like Troy, no matter how many times the player kills Dessie, he will always re-appear outside of the club. If the player skips work at Maisonette 9 for an extended period of time, Dessie will call Luis complaining about it. If the player attacks in or near Maisonette, Dessie will come after the player. Dessie can be heard on Integrity 2.0 when Lazlow and Jorge are trying to get into Maisonette 9. Only the player can injure Dessie whether its through hand-to-hand combat, with a vehicle, or with a weapon. He is immune to damage from anything else(gunfire,punches etc). Dessie must either have his phone switched off or never on him because if you call him while standing right next to him it goes straight through to voicemail. It's also possible that he was never meant to be called. This page was last modified on 27 October 2013, at 15:56.